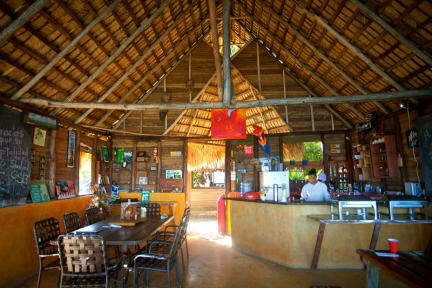 Accommodations are simple yet very comfortable single and queen beds in grass roofed palapas featuring canvas walls. The 12-acre Tubagua Plantation is an ideal place to relax for a few days immersed in nature and village life. It makes for an ideal base camp for independent travelers from which to explore the north coastal region or for those driving around the country. The owner, a Canadian journalist and 25-year resident of Puerto Plata, is a wealth of knowledge and local lore. The social area centers around a grassy terrace featuring a spring fed cocktail pool and a bar/dining area looking out over the awe-inspiring view. Laid back, casual and unpretentious, Tubagua welcomes experienced travelers and those with a bent for something different who don't require a lot of babysitting yet could use a bit of help in planning what to do and see in the region and around the country. By reservation only; no walk-ins. Please advise as to your arrival time.